Say it ain’t so! Molly and Lil, two of the Park’s stable of six mules, are retiring this year. One of the most popular parts of guests’ visits to Great Falls, the mules represent an important part of the C&O Canal National Historical Park’s history. Historically, the mules were instrumental in the running of the canal boats, acting as the “engines” of the heavily laden cargo boats as they pulled them through the locks. The mules even lived in the front cabins of the boats during the working season. Today, they continue to work at the historic Great Falls Tavern. 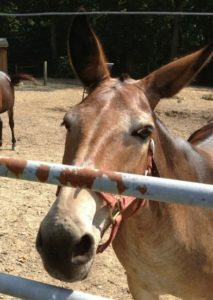 Lil, one of the Park’s longest working mules, has been in residence since 1994. She has spent the majority of her time at the historic Great Falls Tavern with mules Eva and Dolly, pulling the Charles F. Mercer replica canal boat. 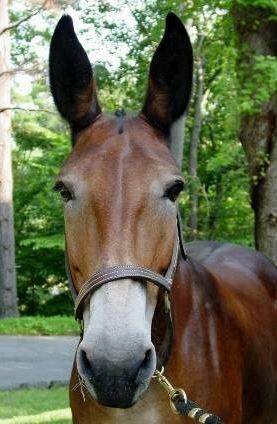 Molly, one of the smallest mules at 14 hands tall, came to the Park in 2001. She, along with mules Ada and Nell, regularly pulled The Georgetown replica canal boat, located in Georgetown, before it closed. Molly and Lil will be retiring to enjoy the quiet life and live out their remaining years at a private home. Today, The Georgetown canal boat has been retired, and a new boat is under construction for use at Georgetown upon completion of canal restoration in the area. The Charles F. Mercer is currently in dry-dock while construction is underway at Great Falls Tavern. The Park’s remaining mules, Dolly, Ada, Nell and Eva, in residence from spring to fall at Great Falls Tavern, regularly greet visitors for interpretive visits. Park Ranger Mark Myers is the Park’s mule tender and is devoted to their care and well-being with help from other Park staff and volunteers. During the winter, the Park’s mules head to the George Washington Estate located at Mount Vernon in Virginia. Click here to learn more about the C&O Canal’s mules.